Since I reduced my sugar consumption 10 years ago I’ve never been fitter, everyone says I look younger, and my weight is the same as when I was 20 years old. I was lucky in a way, because I was diagnosed with full blown diabetes, and was shooting up insulin whilst pregnant. (It’s another case of thinking things had gone wrong, when in fact it was a great educational gift). In the short term, I became the most boring person in the world, having to eat certain things at particular times, but long term, I learnt a lot about health and how to stay young. Called gestational diabetes, it is a condition experienced by a lot of pregnant women, and by most pregnant women with twins. In short, the pancreas cannot cope with the huge load of the babies as well as processing the woman’s regular intake of sugar, and insulin is needed to help. 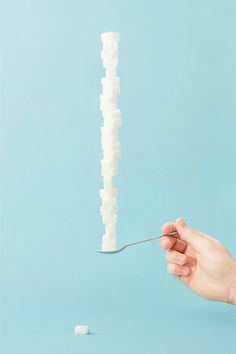 We should be having six teaspoons of sugar a day. Most of us eat 10 X that amount and don’t even know. 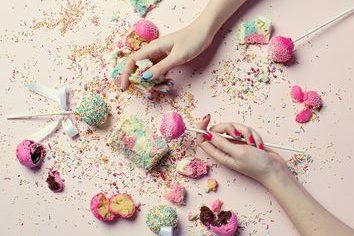 It was the best way to become educated about the dangers of sugar, hidden sugars, and what to actually eat to reduce the consumption of sugar on the diet very quickly. I was shocked by the amount of hidden sugar in food, especially foods I thought were healthy. Cut out any drinks other than water, coffee, tea (and wine!). All juices, and smoothies whether freshly squeezed or cold pressed or anything contain sugar. I now think of them all as lolly water. They are a sweet hit, like it or not. The only freshly squeezed juices that are ok are vegetable juices, pure, freshly squeezed, and my system, can’t take them – they taste too strong for me. I like simple solutions, and this is one of them -oh, and delete any sugar you are adding to your coffee or tea. I do enjoy wine, I have reduced my consumption of it, I can’t delete that, but that’s me. Delete all bread or pasta after 3pm. These foods are high in carbohydrates and sugar, and put a big load on the system at any time of the day. Towards the end of the day, just like your mind, your organs are tiring, it’s time to ease the load, not increase it, so cutting these from 3pm, helps, and guess what? It will help you lose weight – very quickly. Look at what you are eating for breakfast. Most of us eat breakfasts loaded with cereals, bread or porridge or some version of those. These are all high sugar foods, and not a great way to start the day. Eggs ( and bacon, avacado, tomato) are where it is at, or protein rich left overs from the night before (you will get use to them) or natural yoghurt with your own home made nut toppings. This can be tough to start with as eggs take longer to cook, but it pays off. Eat more real food. By real food I mean raw, unprocessed food like carrot sticks for snacks, salads for lunch, steaks at night, fruit or nuts for snacks. We all eat far too much processed, pre-prepared food. The more real food we eat, the better off we are. Even if you replace one regular snack a day with something fresh, you’ll be ahead of the game and reduce your sugar intake. Water: I know I mentioned cutting out sugary drinks already, but I can’t preach enough about drinking water. The vast majority of us do not drink enough of it. It detoxifies, curbs your appetite and helps your organs function. It also plumps up your cells which can lead to younger looking skin. Clean out your pantry: Living in a house with two 9 year olds, I have learnt the ONLY way to avoid eating sweets and sugar loaded food is to remove it from the house. If chocolate is in the fridge, we will all reach for a piece, same with lollies, chips, everything. Ditch it. Eat at home more: We never really know what we are eating at restaurants. Many sauces, browning techniques and pre-preparation of food contains sugar in high doses. When you cook at home, you know exactly what you are eating – and it is cheaper in most cases too. Am I The Only One Who Hates Shopping For Swimsuits? Renae Leith-Manos is a Sydney-based writer, mum, Paddington Terrace design guru and travelholic. She loves discovering people’s stories, Parisian coffee, Baccarat Chandeliers, martinis at The Botanist Sloane Square and her Levis collection. Renae knows how time-poor women are, and how much they value the right information whether for a holiday, an outfit, recipe or relationship. She is often seen with her iPhone in one hand a champagne in the other, wearing MAC, somewhere in the world chatting to someone inspiring. She believes life is too short not to enjoy every minute. A-Beauty The Aussie beauty trend sweeping the world.